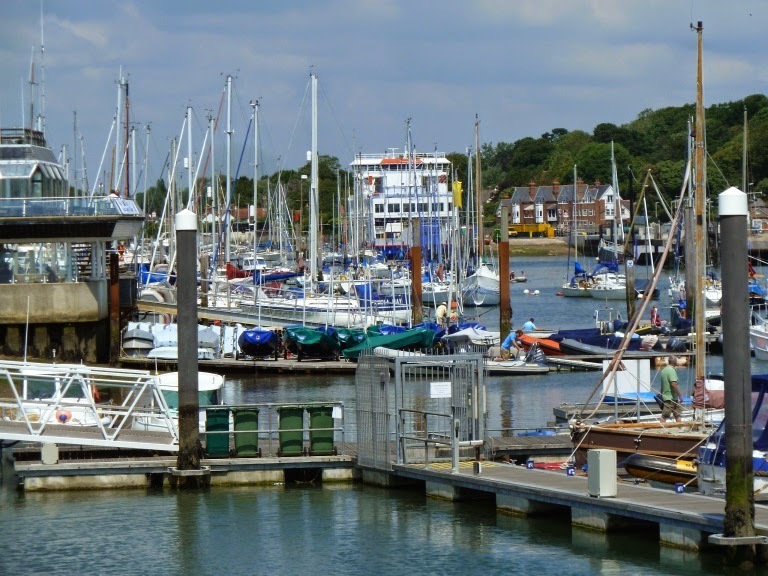 Well actually the slipway, but a great place to sit and watch the comings and goings on the river. 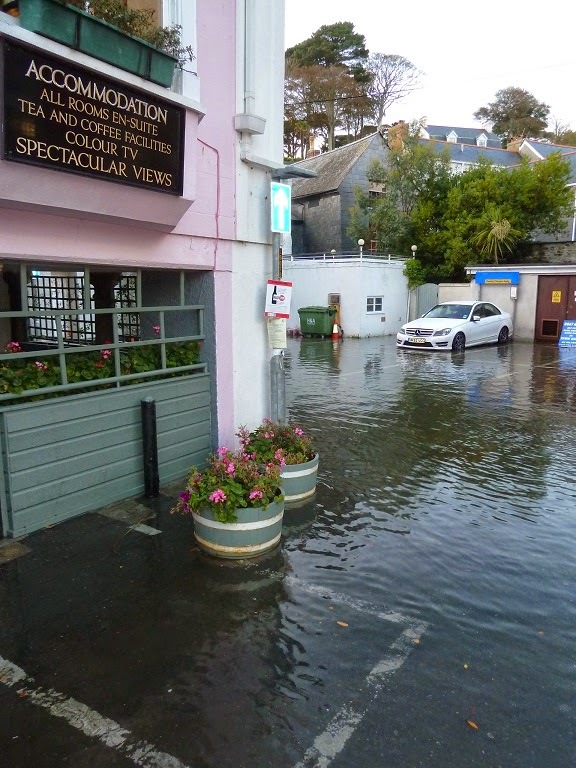 Sadly the cafe which is attached to the salt water swimming pool will be closing for the winter shortly. 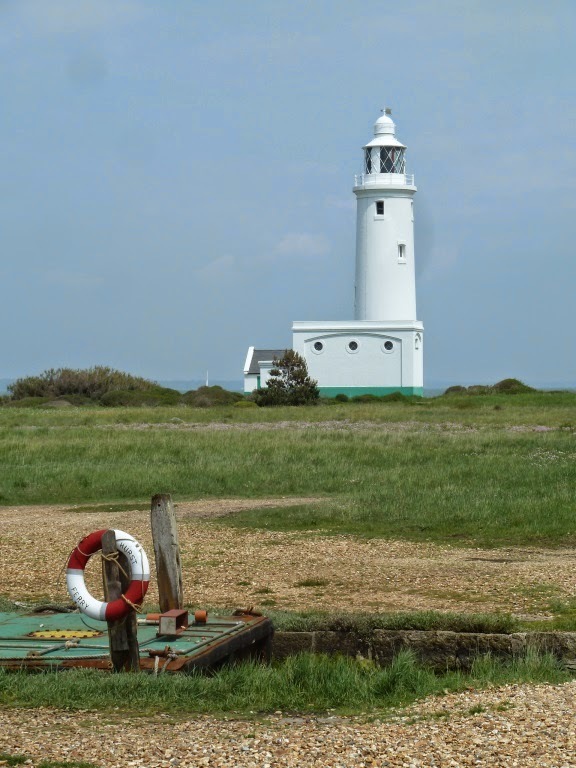 It's probably a couple of miles to walk from Keyhaven to Hurst Castle, the worst of which is walking on top of the shingle bank which forms Hurst Spit. The stones are well compacted but they still shift under foot which makes walking hard going even on the flat. By contrast launching the kayaks from the foreshore in Keyhaven it's a leisurely paddle through the moorings out to the Castle and lighthouse. 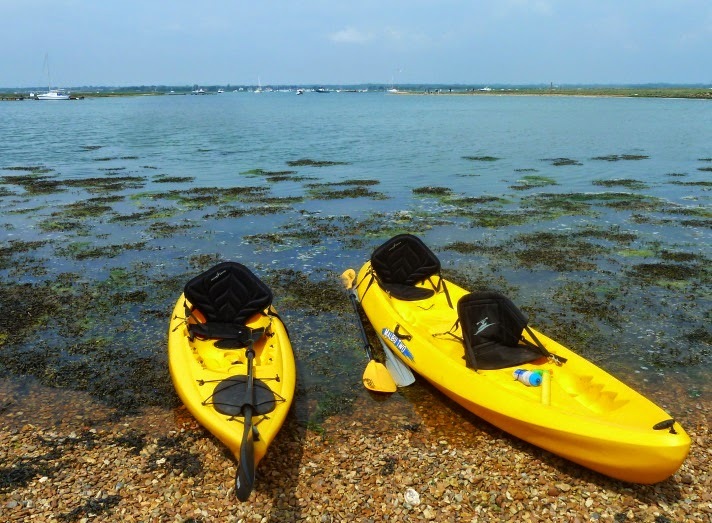 The spit means that the entire route is protected from the prevailing westerly winds, while one should always be aware of the dangers, tides and weather, it's was safe and pleasant spot to try out the new sit on top kayaks. 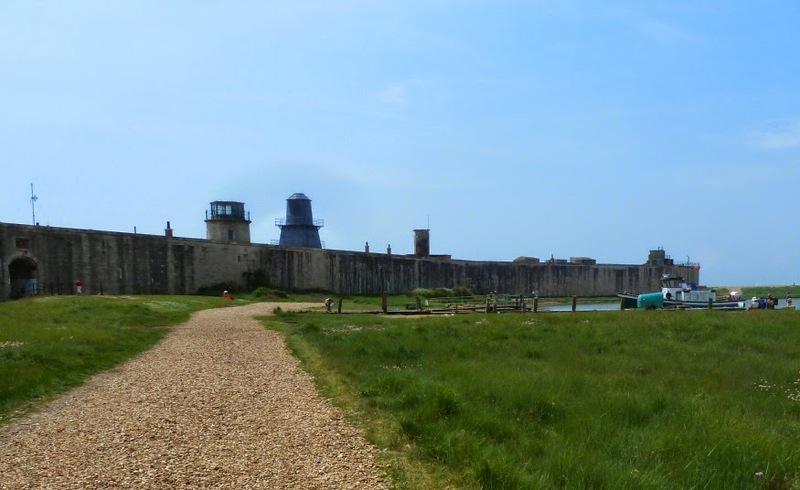 Originally built in the reign of Henry VIII, the castle was at one time on of England's mos advanced artillery fortresses. Today it's preserved and operated by English Heritage, although we didn't do the full tour they did let is in far enough to find the icecream shop. 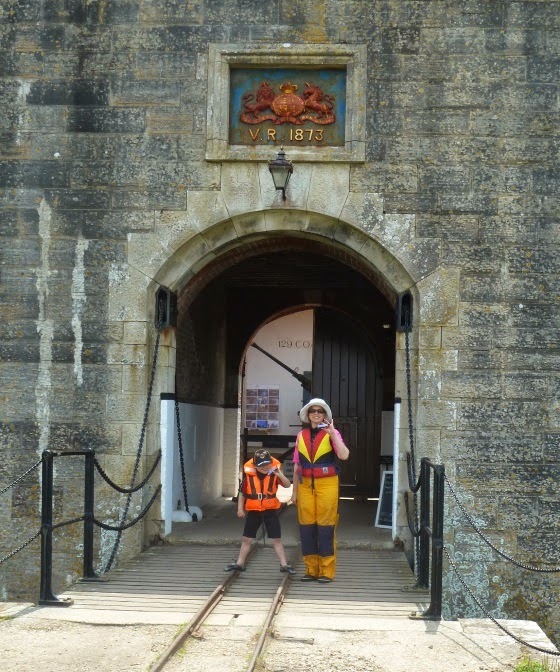 The castle became highly mechanised, presumably during Victorian times, note the railway which connects the dock to the fortress for transporting goods and ammunition. the sheer scale of the place is impressive, massively constructed, positioned as it is exposed to the full force of the Atlantic weather. 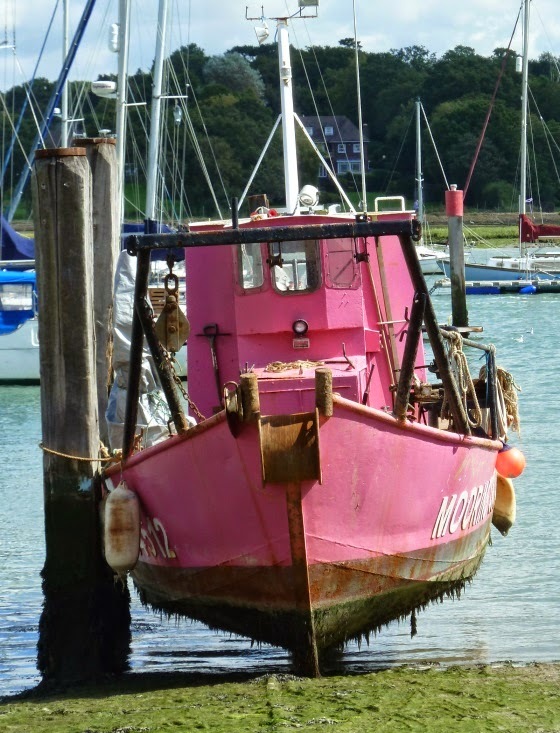 Continuing the recent circus theme and certainly not the Bursledon Eurovision entry - maybe this should have been titled bearded pink lady. 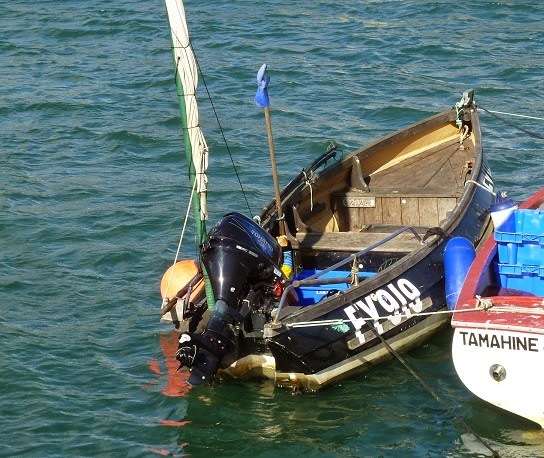 This interesting dinghy has been out in the moorings at Keyhaven this year, I would guess the length at between 14 to 15 feet. 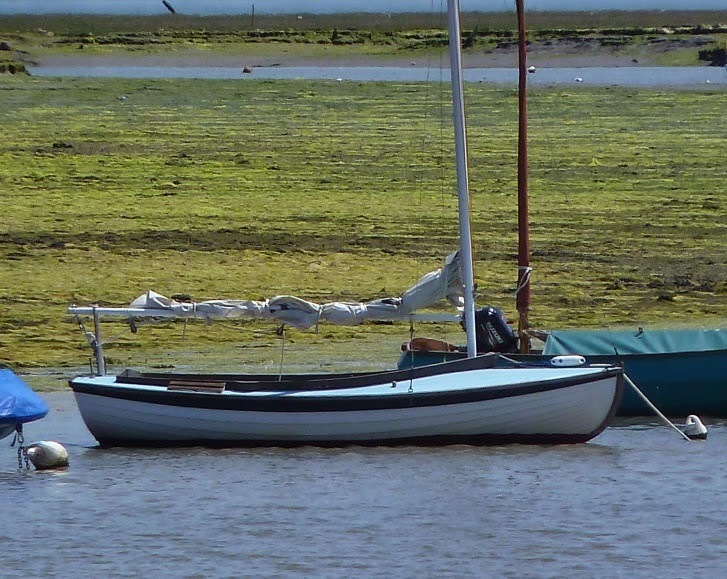 The raised decking is unusual and the deep coaming suggest that it will be fairly dry even in the steep chop that often comes up in the western Solent, which makes me wonder if it's a local boat? 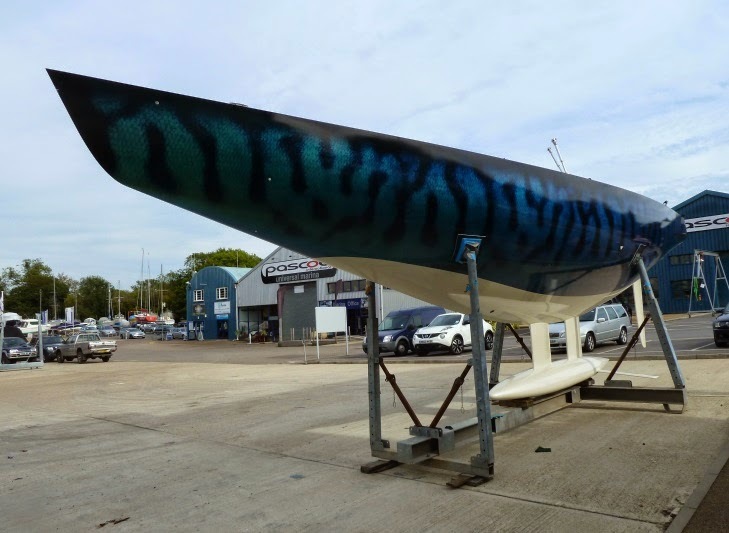 It looks like a giant mackerel has been landed down at one of our local marinas. 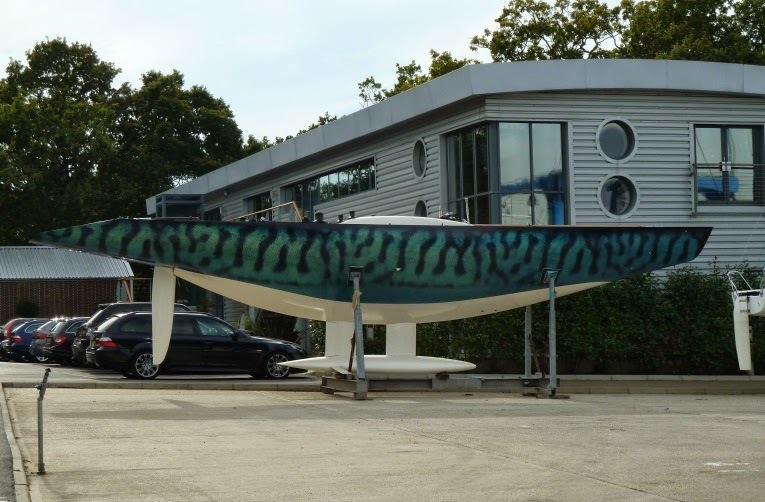 Closer inspection shows that it's a fantastically realistic finish on one of the local meter class boats (a 12 Meter I'm guessing but I didn't have a tape measure). As the nights draw in, the days grow shorter and cooler racing in autumn can often be a cold and gloomy experience. 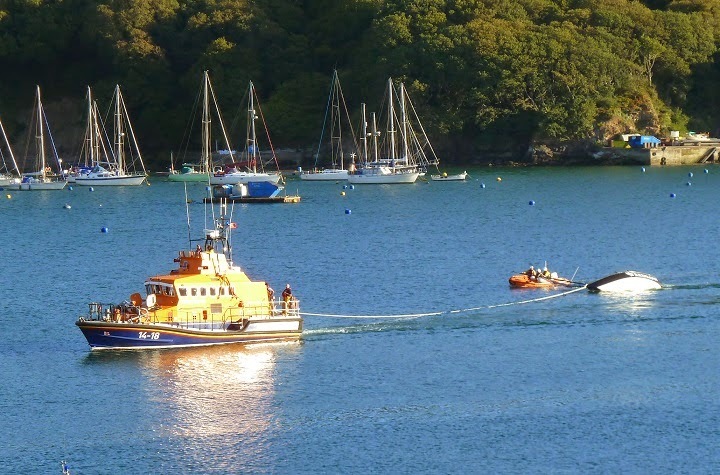 But occasionally there is a fine weekend with late afternoon sunshine as the crews make their way back to harbour. A good breeze is still blowing and the late afternoon sunlight becomes saturated with colour. Barely 2 weeks ago the winter weather seems to be rushing in. 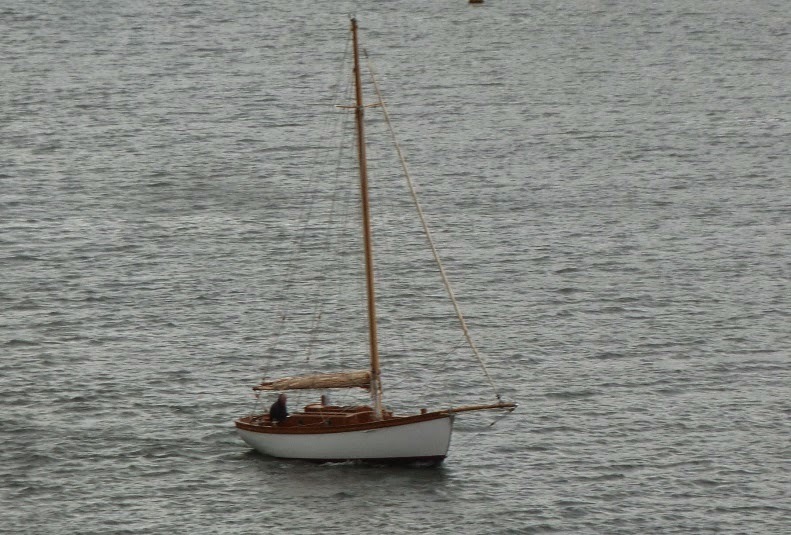 A few classic boats seen around Fowey. 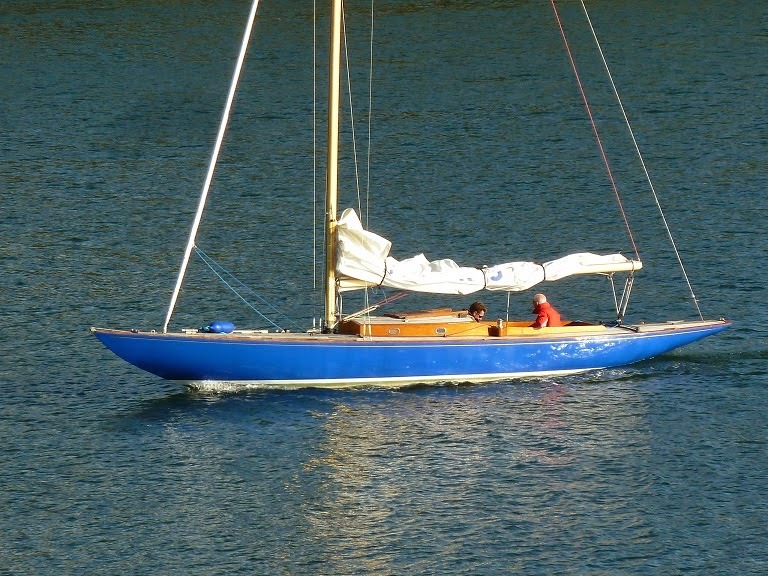 No idea what this boat is, long and lean she has classic long overhangs at bow and stern. From a distance this looked like a Harrison Butler, but I've been nown to be wrong on more than one occasion. 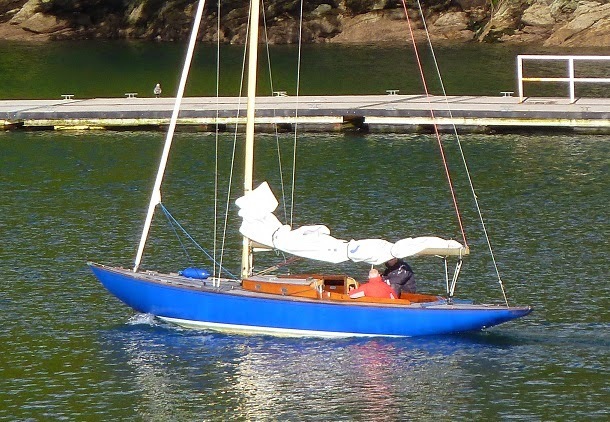 One my all time favorites a Troy class ashore at Fowey Boat Yard and looking immaculate. 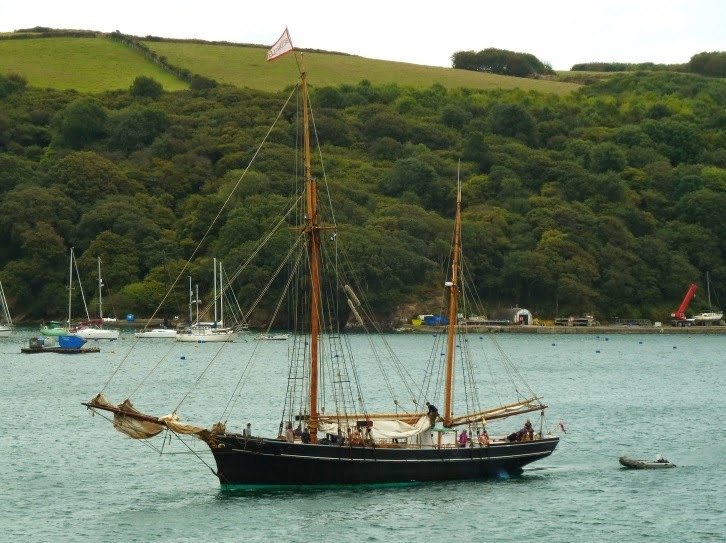 A west country trading ship built in 1904, Bessie Ellen visited Fowey while we were there. 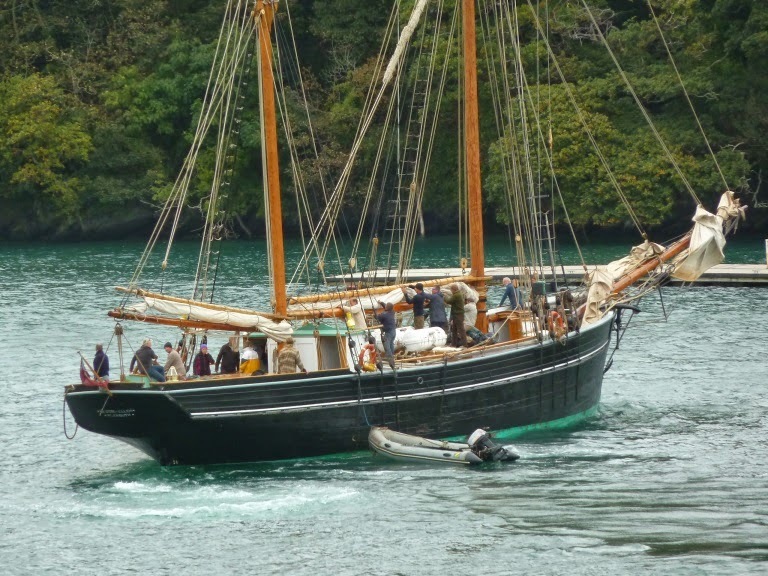 Built in Plymouth in 1904 she has had a remarkable working life and is currently part of the UK core collection of historic vessels sailing with charter crews around the UK and Europe. 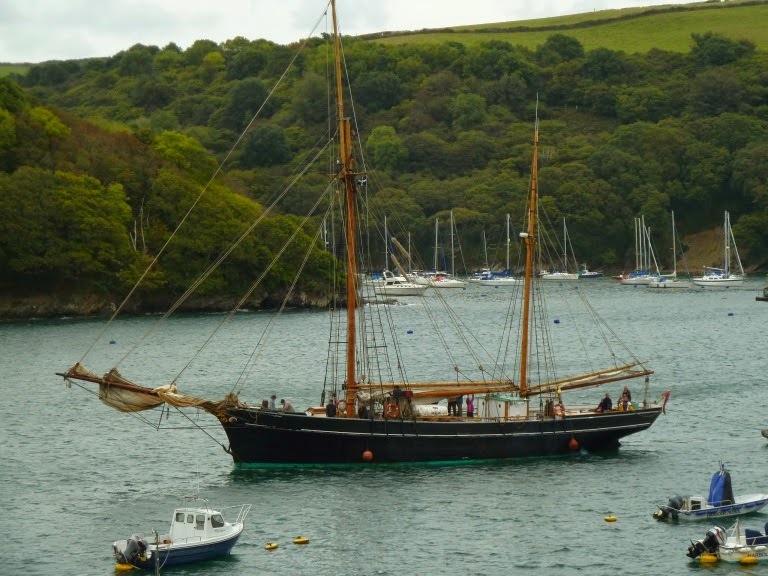 She was a majestic sight making way slowly up the harbour, just the sort of vessel which would have visited Fowey a hundred years ago. Everything seemed very relaxed and the crew all seemed to be well practiced. 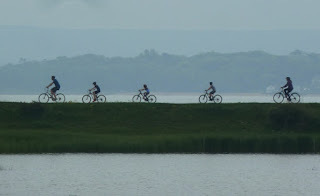 Heading for the visitors pontoon. The pronounced tumble home seems to start at mid ships and extends right back to the stern. This picture doesn't show very well, but the transom, or rather what's left of it after fitting that hefty outboard and well is raked as are most cobles. The bows having a fine and concave entry. 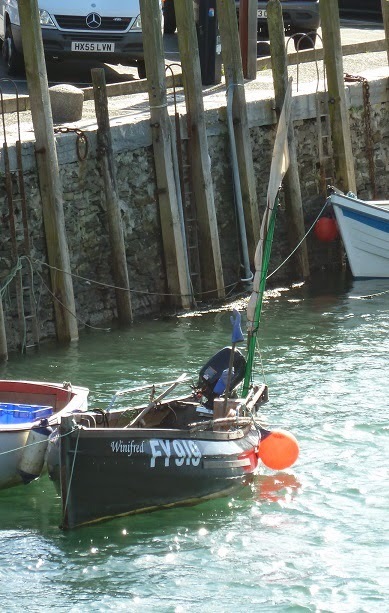 A quick google of fishing records show Winifred is registered at Looe 5.7 meters and hull material fiberglass, there isn't much information other than she is not registered for shellfish or scallops. 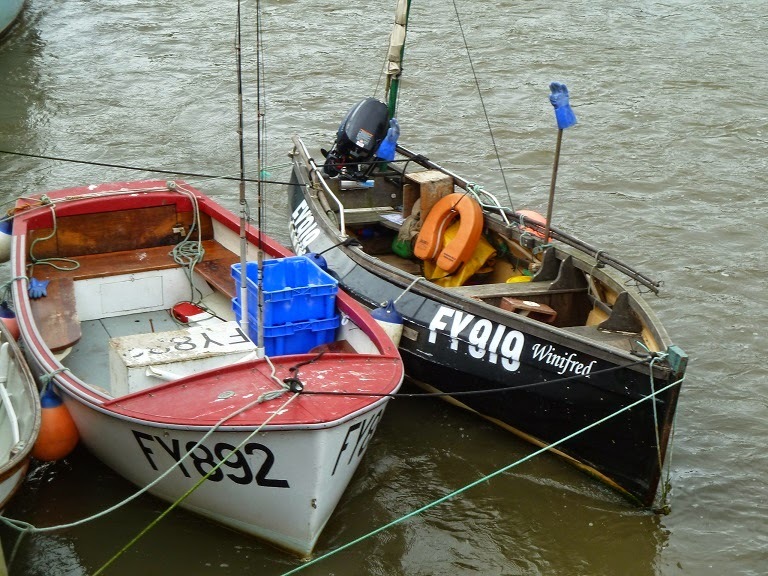 No clue as to how she came to be fishing in Cornwall nor her history or origin. 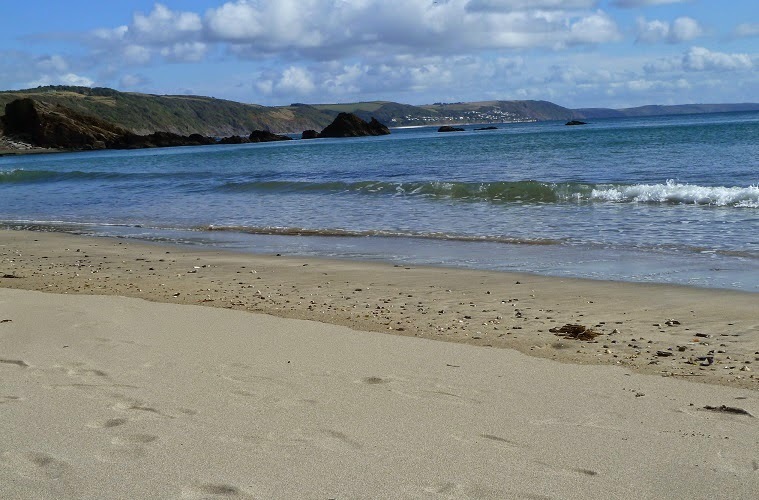 My normal morning run takes me down Fore Street, concious that my foot steps echo loudly in the narrow street, then out along the Esplanade to Readymoney Cove at the entrance to the river. 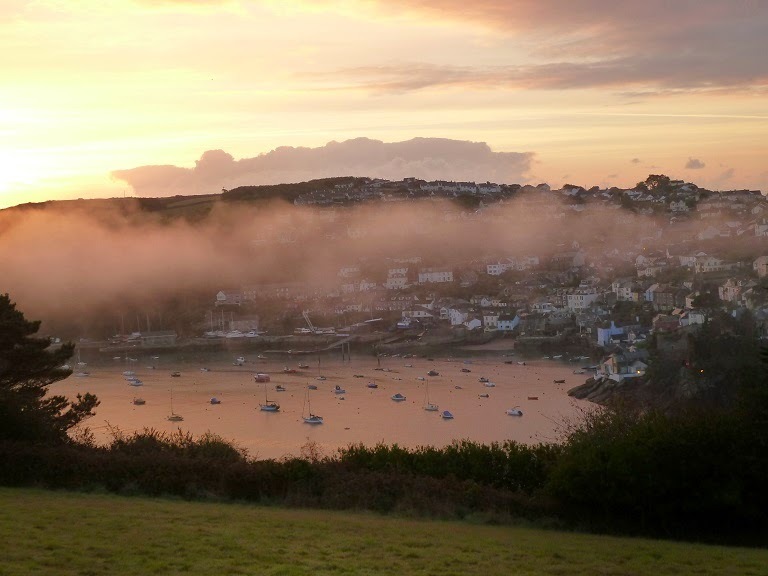 Climbing up the steep rise to Hanson Drive is always the hardest part of the run, but at the top the view of the river across to Polruan is always spectacular. I must be fitter than I think as I didn't need to pause for breath. 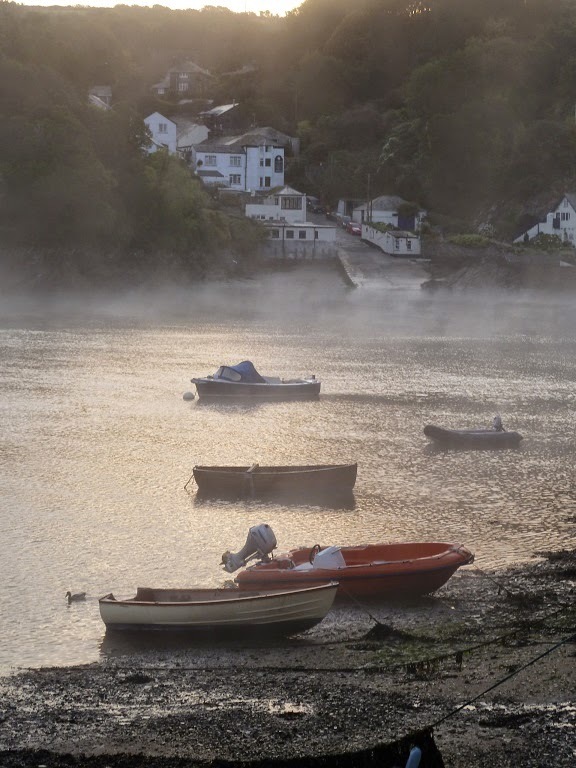 Along past Fowey Hall and then down to the Bodinnick ferry, apart from a few outboard motors and the boats being made of plastic it's a view that probably hasn't changed much for a hundred years. Heading back along North Street the view from the car park next to the lifeboat station shows the mist lifting across the busy harbour. About another 150 yards to home, a cup of tea and breakfast on the balcony, what better start to the day. 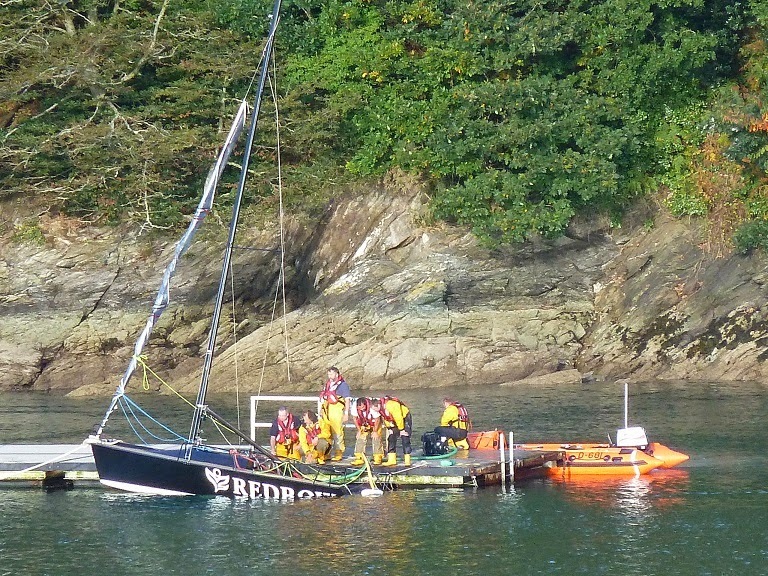 It's been a lively week what with the lifeboat rescue, flooding and then as we returned back to the house on Thursday afternoon, there was a yacht aground on the Polruan shore. 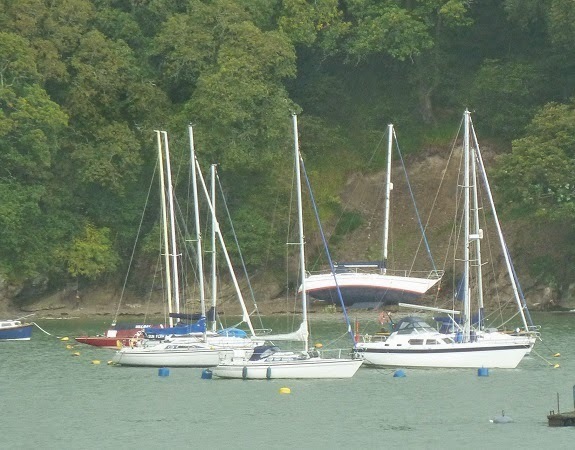 I'm guessing the yacht broke free from its mooring in the high winds and big tides we've been having. 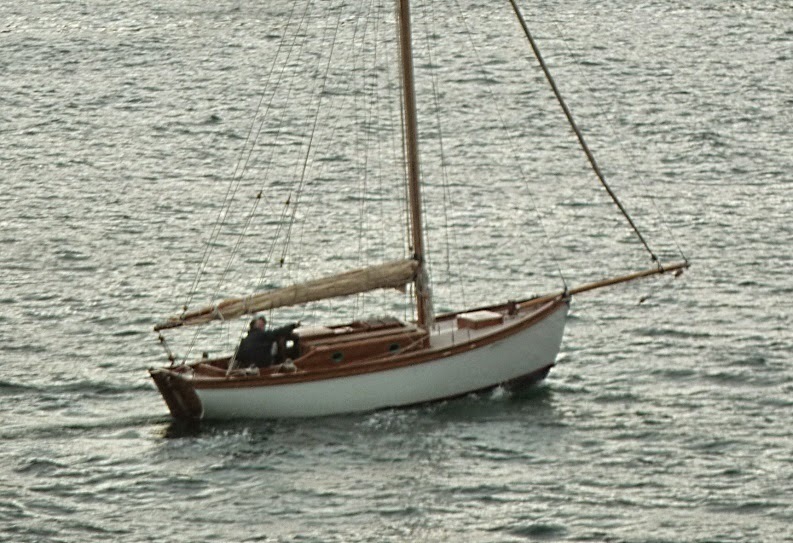 It looks like a Sadler 34 bilge keeler with the starboard keel sticking above the ground and presumably the port keel dug well in. 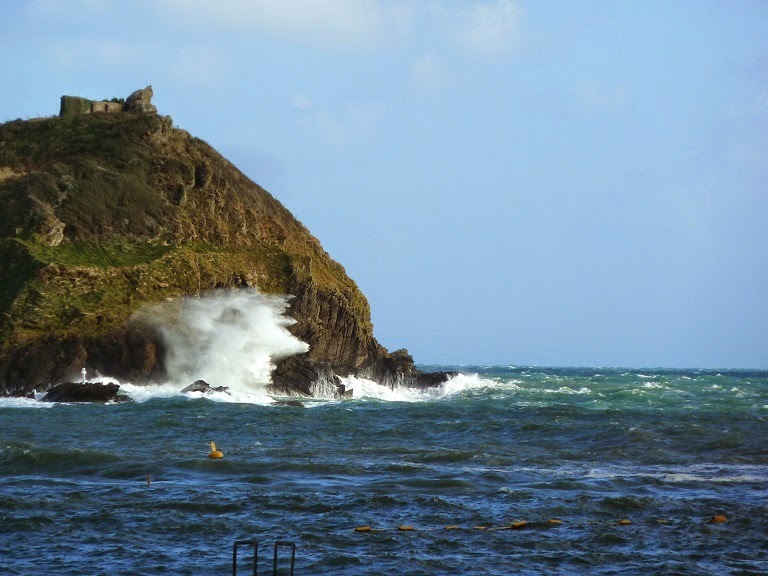 Evening tide was lower, coming off springs and without the wind and the swell pushing the high water level. 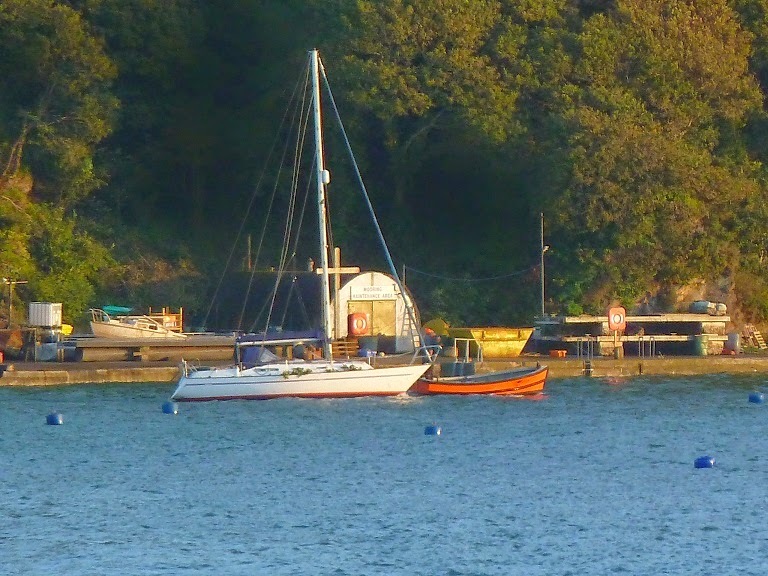 At around 6.30 PM two powerful launches stood by, the water was about two and a half feet short of the waterline of the beached yacht. 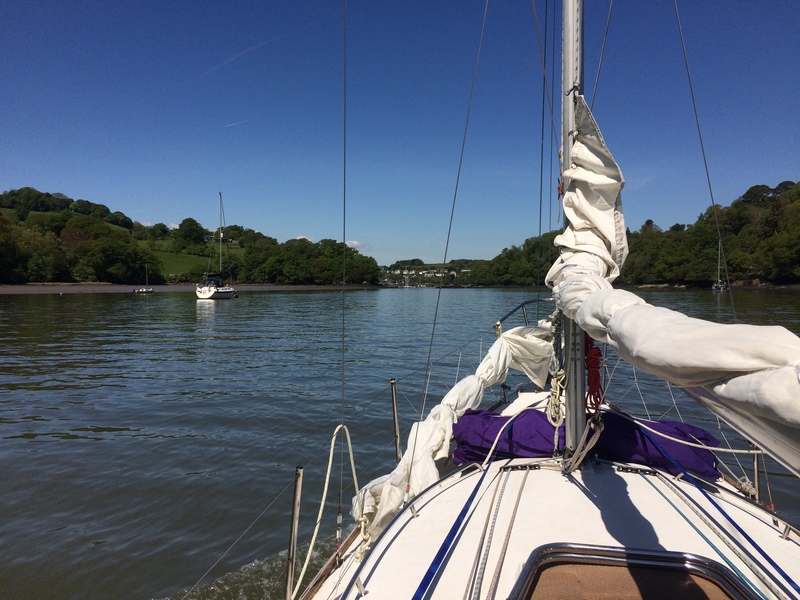 One launch took a halyard from the masthead while the other pulled on a bow rope. 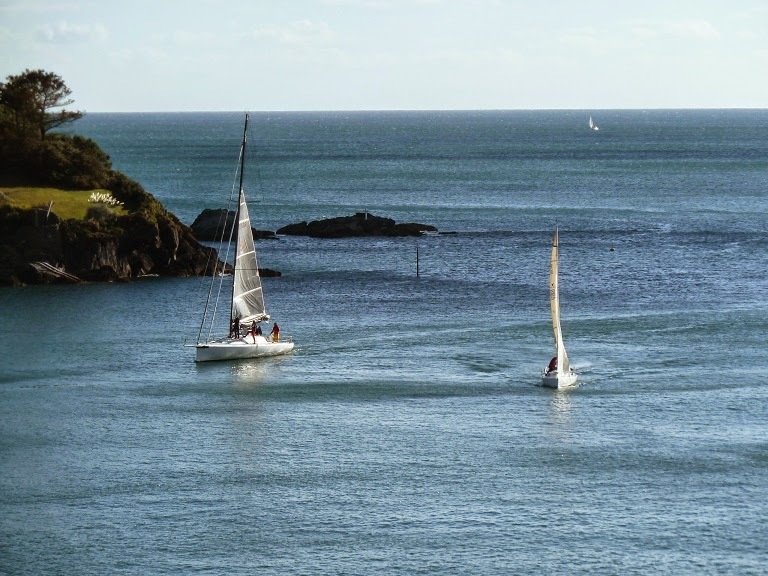 Engines roared and slowly the boat heeled to starboard away from the beach and then suddenly slid down into the water. 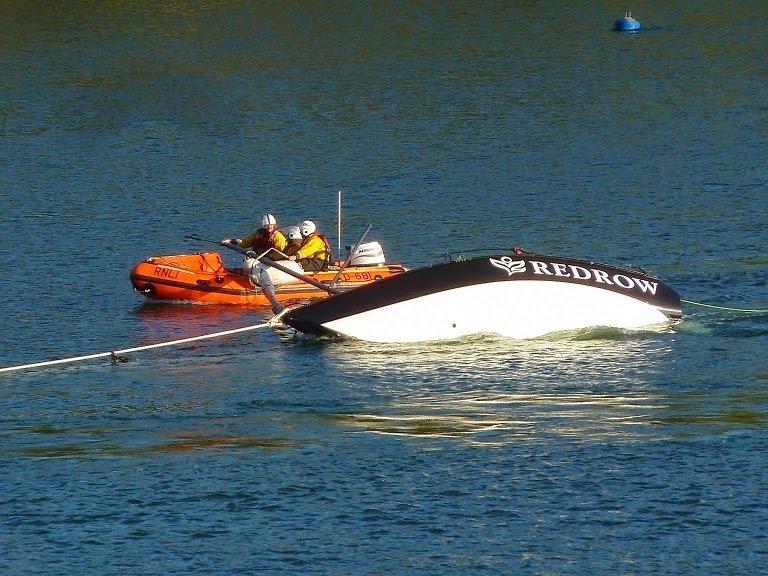 It was perhaps a drastic measure, but the alternative was to have left the yacht stranded for a month or more. 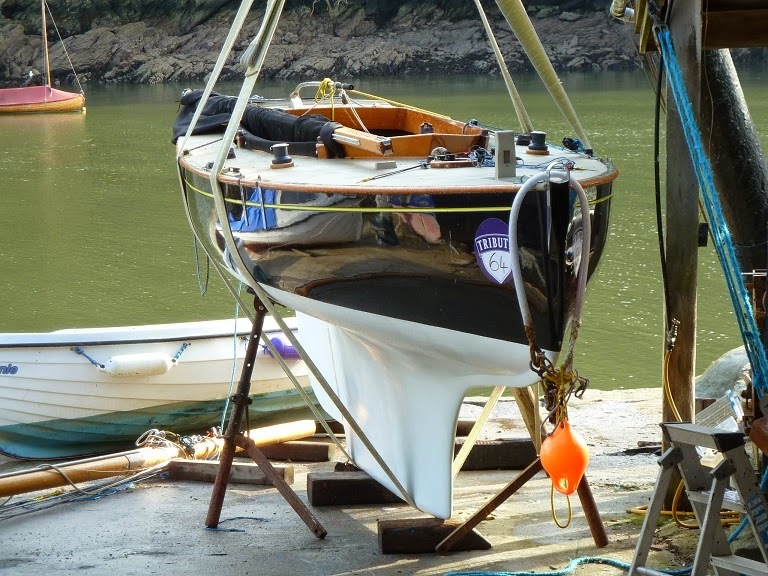 All in all a good result, once the keel bolts have been checked. Below the yacht being towed off to the boat yard. Strangely when we were here in September 2011 another boat broke it's mooring and was stranded in almost the exact same spot, clearly they weren't using the ground tackle I spotted in the Old Station Yard. 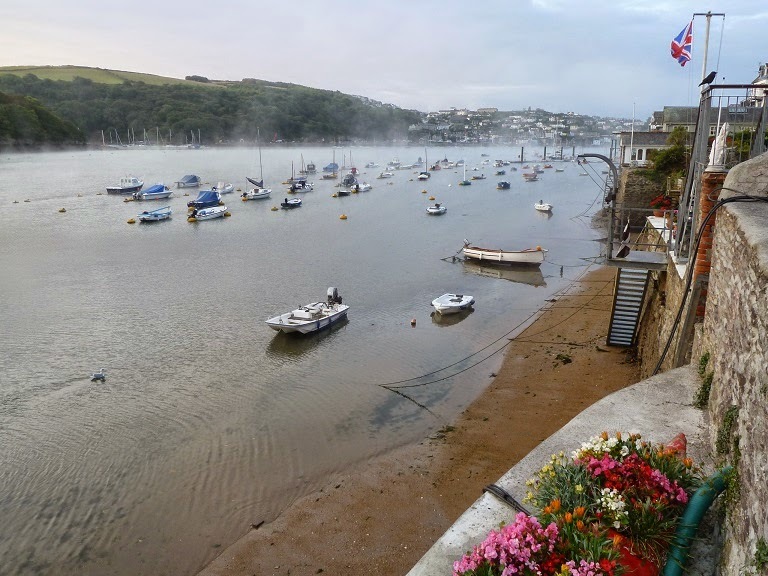 As I said earlier this week there always seems to be plenty going on when we visit Fowey and Wednesday was no exception, the winds had been blowing from the south all day averaging around 30 to 35 knots so near to gale force. 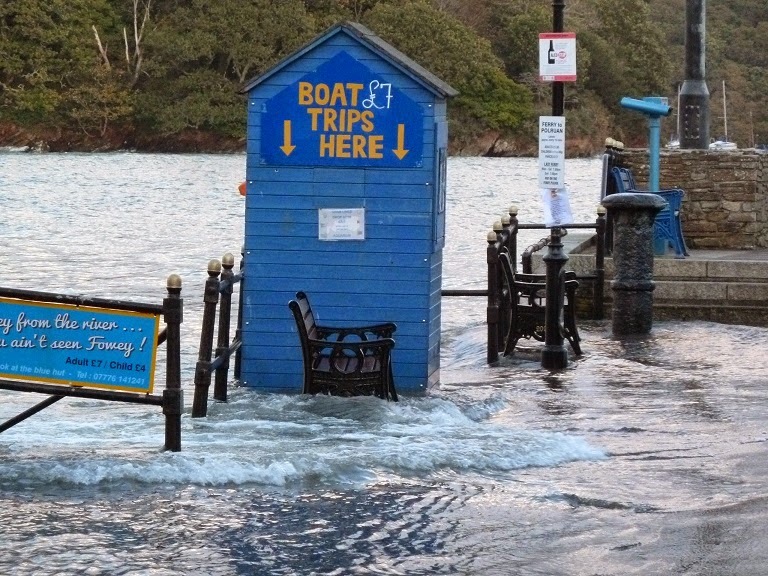 Fowey is a very well protected harbour except when the wind is in the south and the waves were soon piling up at the entrance. 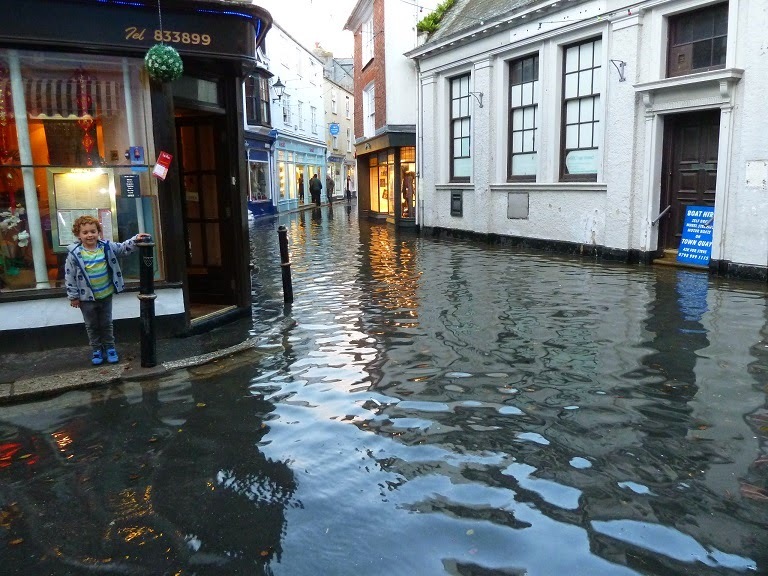 The waves combined with the big spring tide brought the sea over the top of the town quay, flooding the lower part of Fore Street. Someone seems to have taken a light hearted view given the sign they have put up in the old bank building. Accommodation with spectacular views at the King of Prussia. No takers for the boat trips then. 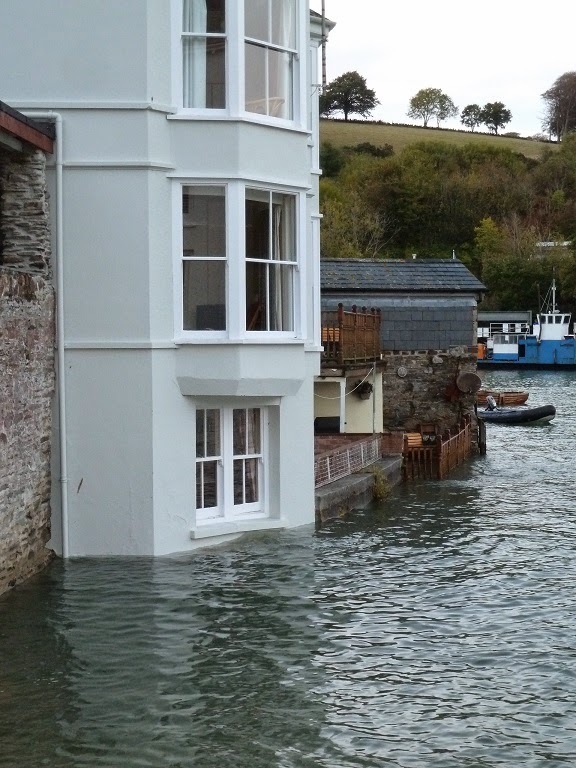 Down at the other end of town near Caffa Mill things were much the same, we were in Fowey in about the same time of year in 2004 when there was similar flooding, as I recall the high water level reached about halfway up the lower pane of glass on this house back then. Apologies to anyone expecting a wonderbra advert, on my morning run I was passing through the Fowey old station car park, which is used for winter boat storage and usually has something interesting and worth seeing. 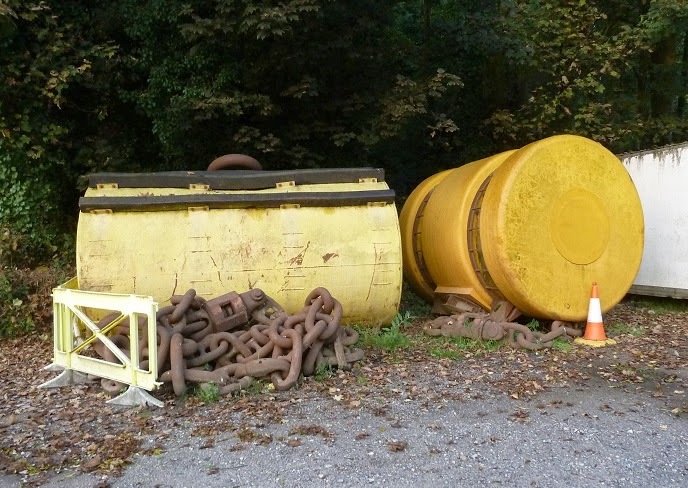 I noticed these mooring buoys, the traffic cone gives some measure of scale, these are substantial ship moorings but not massive. 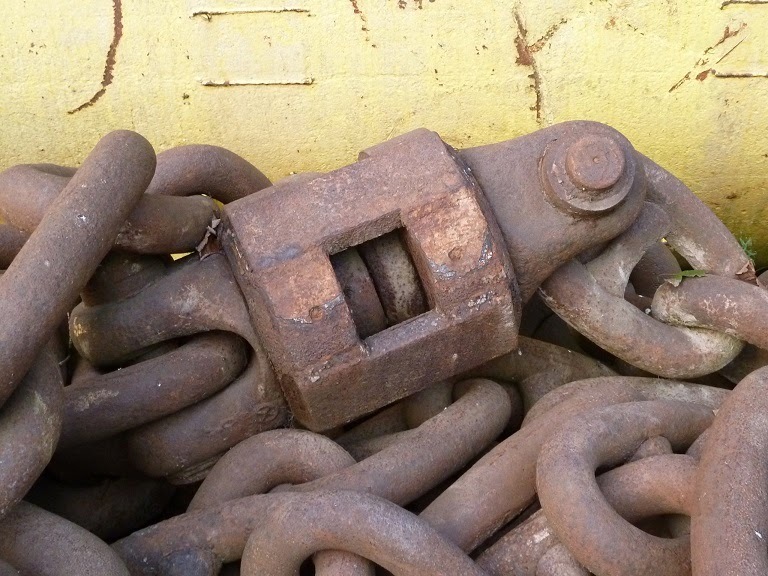 What really caught my attention was the chain, how about that for a swivel? And for all those disappointed by the misleading title - twenty years old this year the famous billboard and alleged cause of driver distraction Eva Herzigová in a Wonderbra gazing down at her breasts with the caption "Hello Boys"
The drive down, or rather west to Fowey takes about 4 hours, so we normally stop at Looe which despite a slightly run down air is an interesting place for a lunch stop (read pasty) and some exercise. The river dries so the boats have to take the ground, lay alongside the wall or rest in specially built supports like the motor cruiser above. The tide was well into the flood when the picture was taken,the gaffer alongside either has a lot of drag to the keel or dries out bow down. 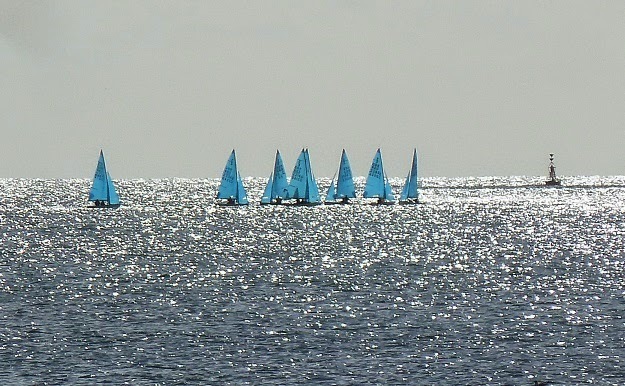 The weather was perfect so I was hoping that the Redwings from Looe Sailing Club might be out, in the event it was the south west area Enterprise meeting so instead of red sails there was a fleet of blue out in the bay. 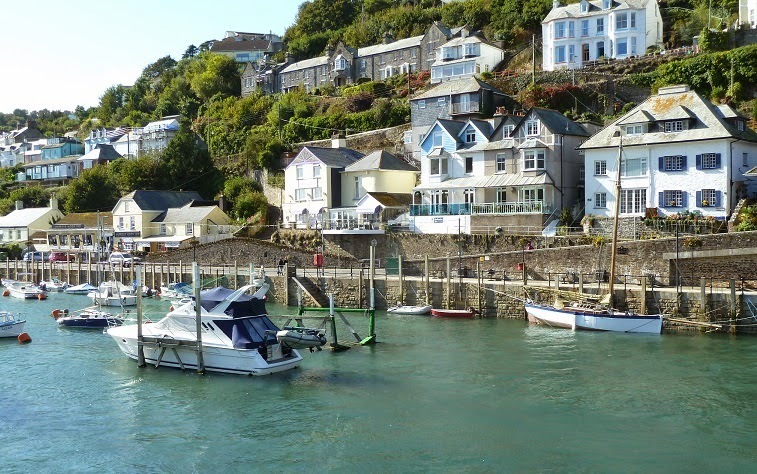 Fowey is small and picturesque but it seems every time we come here there's some excitement. Having unpacked after the all too long drive, we wandered down to the town to see what was what, when the lifeboat went tearing off on a "shout". 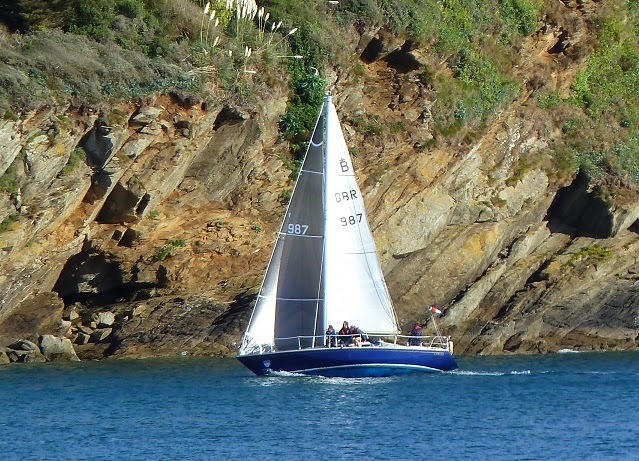 Nearby a local sailor had a hand held VHF and revealed that a yacht had capsized in Carlyon Bay. 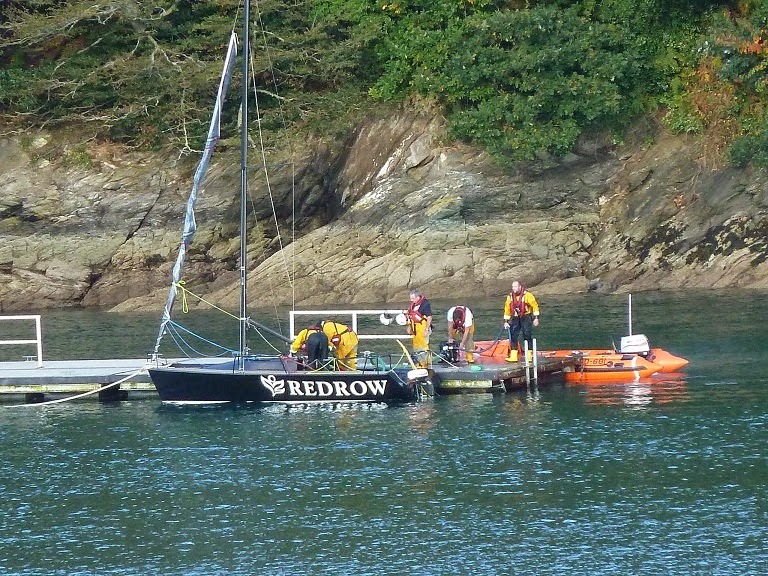 A couple of hours later the lifeboat assisted by the inshore boat returned towing the stricken yacht which was about 20 feet in length. 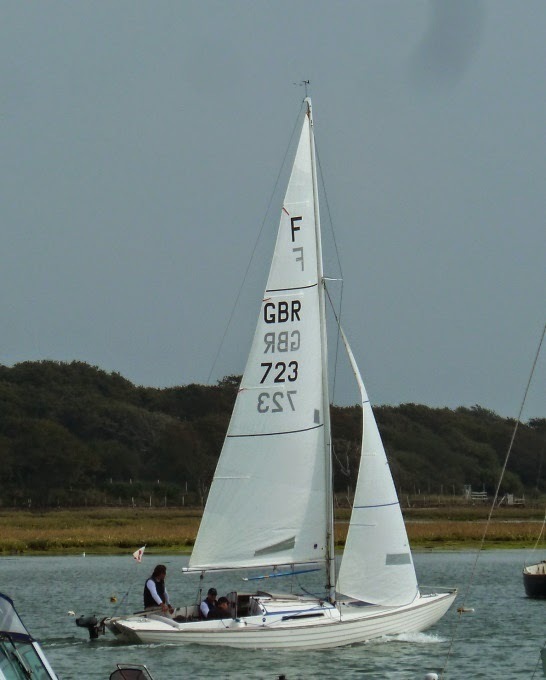 From the way the water was flowing past the hull, it seemed like the keel was still attached or at least most of it, so perhaps the capsize was due to a broach or being over pressed as it was quite a windy afternoon. The lifeboat crew soon had her alongside one of the river pontoons and a large capacity pump going. It was amazing how quickly the boat was floating up on her regular waterline, although looking at the picture above it may well have gone another way as the weight of water was clearly pulling the stern down. 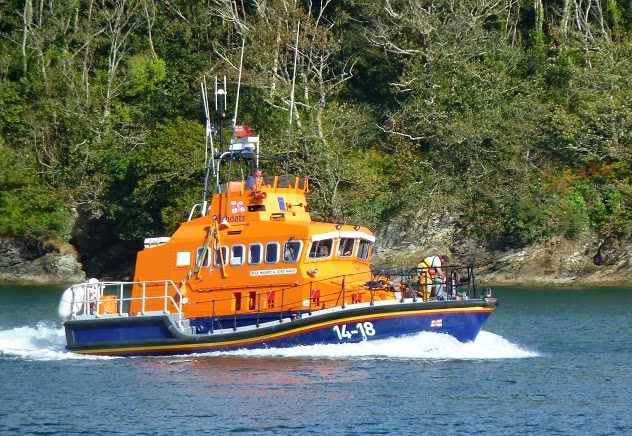 We heard on the VHF that the yacht's crew had been picked up by another boat, none the less let's give a big thank you to the Fowey lifeboat crew. 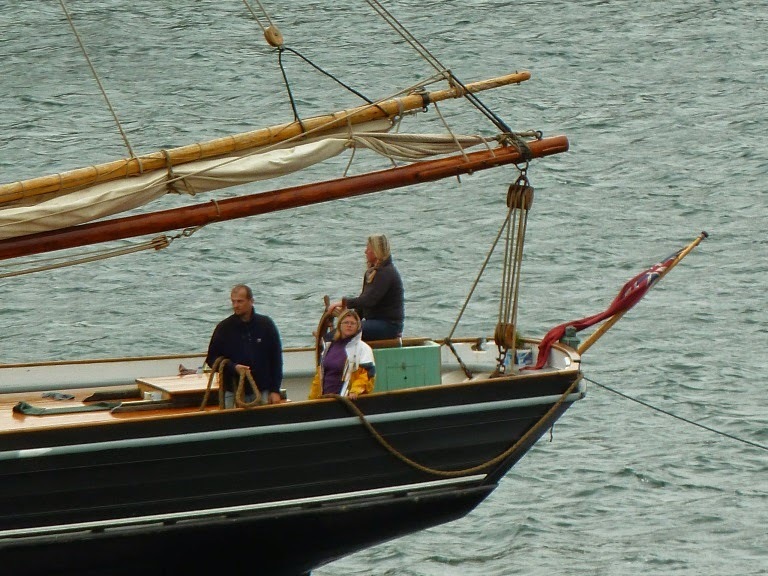 Judging by their smiles and grins they were having a good time once the yacht was back in harbour. 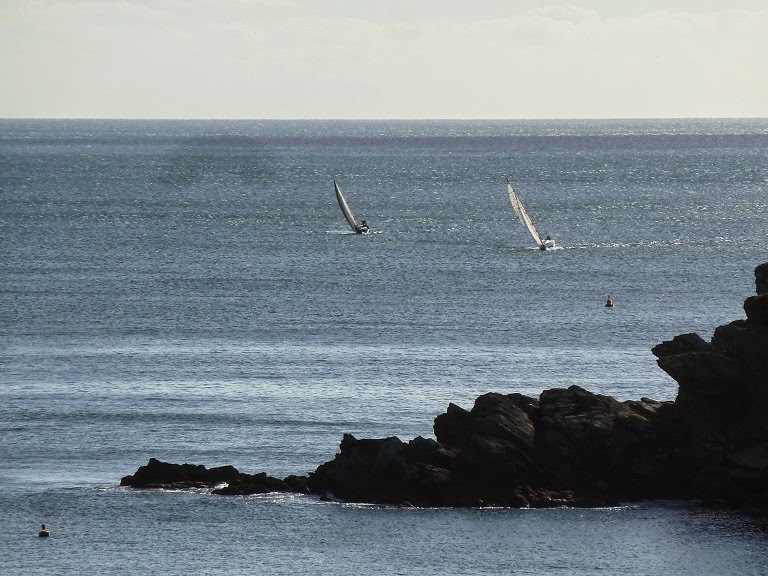 What could be finer on a late and sunny September afternoon than quietly sailing up between the crowded moorings on the incoming tide. 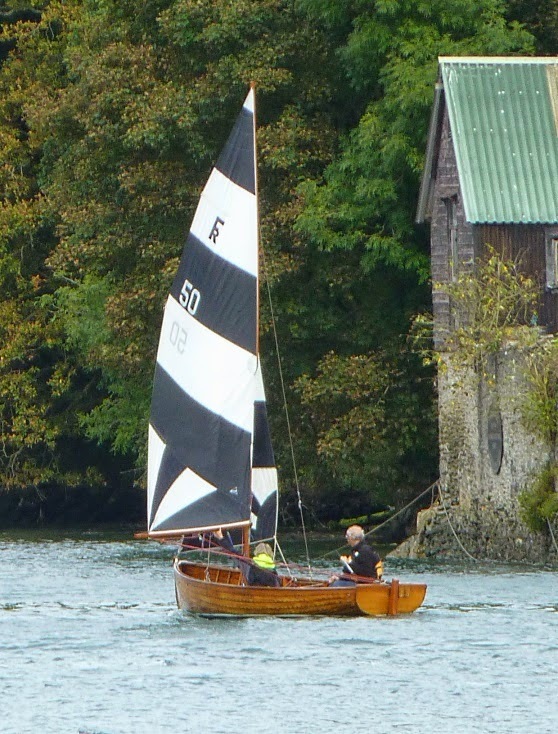 The boat is a Memory which were built locally until a couple of years ago, she was soon out of sight on the other side of the river, only the topsail showing heading up toward the Elephant Boatyard and the Jolly Sailor. 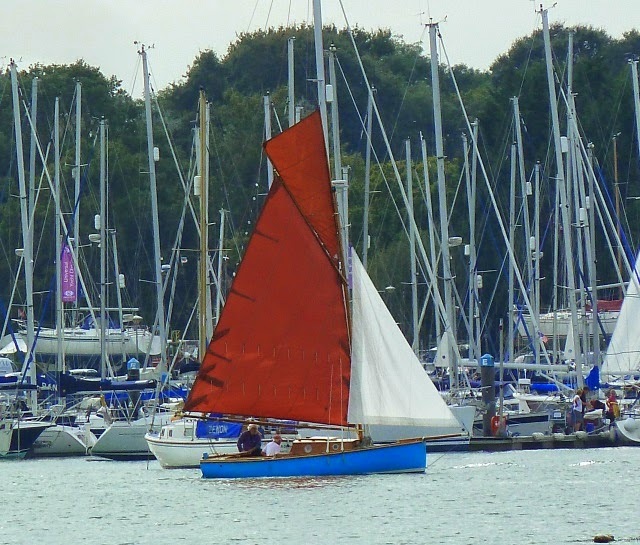 OK, I know that I said last week's would probably be the the last of the series but I couldn't resist these two Nordic's under sail, although the top one looks like it might be motor sailing on it's way out of the Lymington river. 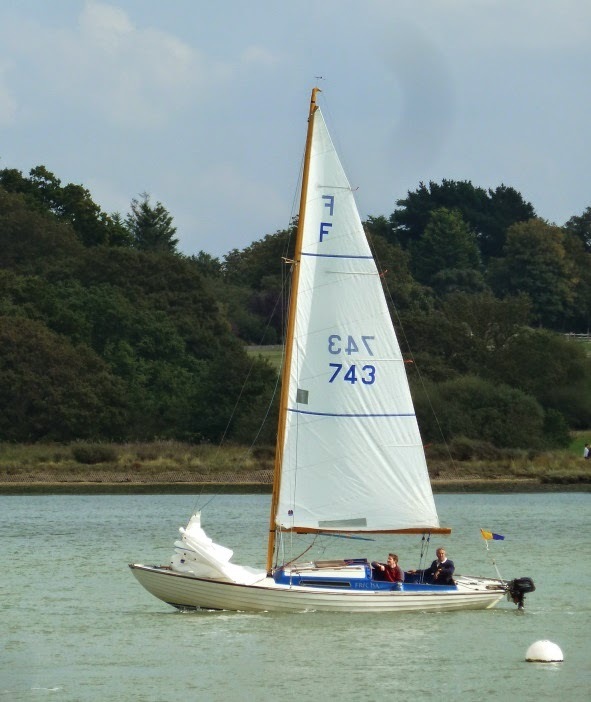 Below a Hamble boat returning under main, the crew looking very relaxed as they head upriver with racing pennant still flying. Better known as the ink spot test, where the personality characteristics and emotional functioning of patients are examined based on their interpretation of blotted ink images. So I was wondering if the same technique might be used to try and understand motor boaters. Tell me what you see in this picture?